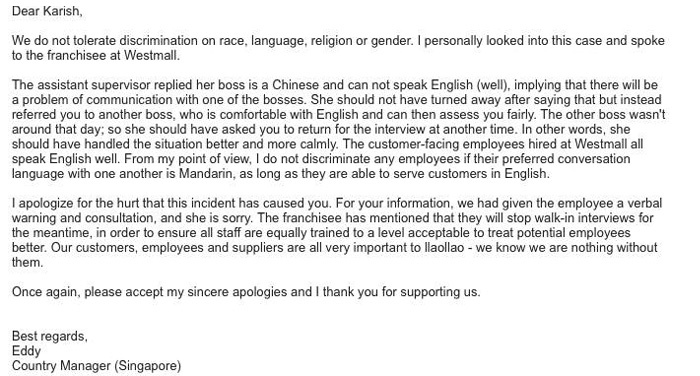 Frozen yogurt chain llaollao Singapore has apologised after the company’s staff turned away a local job candidate for not being able to speak Mandarin. The Tripartite Alliance for Fair and Progressive Employment Practices (TAFEP) is looking into the matter, and whether there was a breach of the regulated guidelines. The incident came to light after Karish Kaur, who approached the West Mall branch for a walk-in interview for a part-time position, posted her experience on Facebook. Upon arriving at the branch, she was led to the back entrance, where a member of staff was waiting. 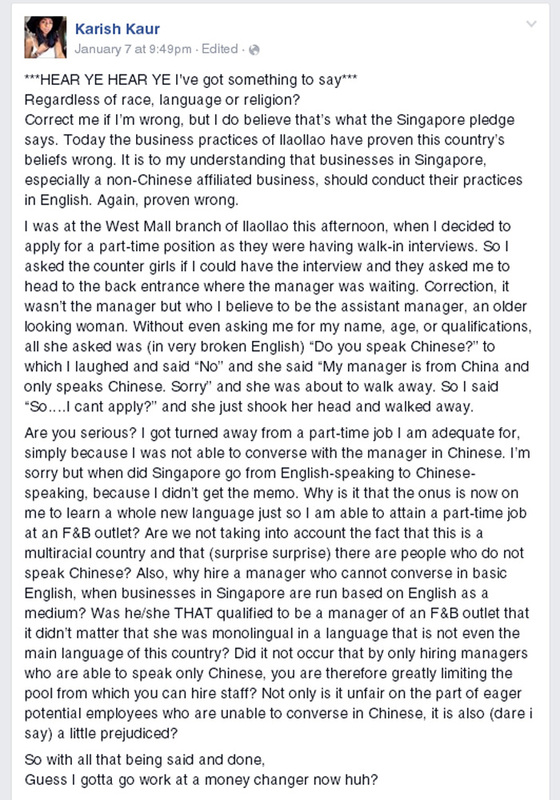 “Without even asking me for my name, age, or qualifications, all she asked was (in very broken English) ‘Do you speak Chinese?’ to which I laughed and said ‘No’ and she said ‘My manager is from China and only speaks Chinese. Sorry’ and she was about to walk away,” Kaur explained in a Facebook post. 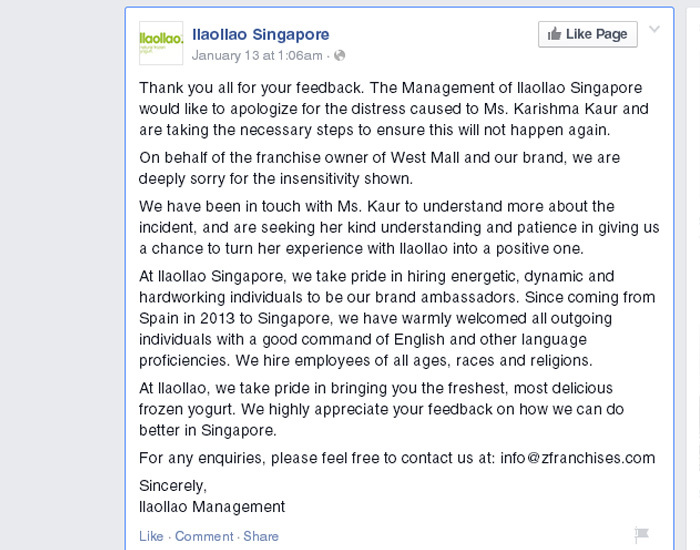 llaollao’s country manager, Edwin Ferroa, responded to Kaur’s post by email, admitting the mistake. “The assistant supervisor replied her boss is a Chinese and can not speak English (well), implying that there will be a problem of communication with one of the bosses. She should not have turned away after saying that, but instead referred you to another boss, who is comfortable with English and can then assess you fairly,” he wrote. TODAY also reported TAFEP is looking further into the details of this complaint. “According to the Tripartite Guidelines on Fair Employment Practices, if a job entails proficiency in a particular language, employers should justify the need for the requirement. In this case, there was a potential contravention of the guidelines,” the paper quoted TAFEP’s spokesperson as saying. Should HR be concerned about these less-than-desirable office spaces?..